Back to the White River again today for the last day with Larry Richards until June. I started the day off at Gastons again. 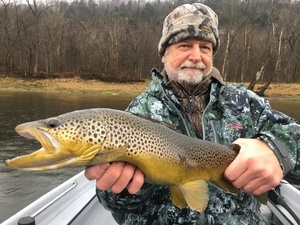 The water was slowly rising as projected so I ran straight to Cane Island and put a brown in the boat on the first couple cast. I noticed the rise wasn't as fast as yesterday but I thought it would trigger a great bite. Wrong Again. I underestimated the effect the high pressure had on the browns. It wasn't a bad day just not great like the two days prior. We landed 9 brown trout and wrapped the trip up around 2pm.